Quality and Reliability so evident in MIFCO products for over 50 years built into the MD-250 digital hand lance pyrometer. This pyrometer has a rugged solid state instrument with 3/8″ high numbers mounted in a rugged aluminum housing. The instrument is controlled by a push button on the instrument face and powered by two AAA batteries. The aluminum housing is held together with two screws so that the thermocouple and battery replacement are simple. The 12″ long enclosed thermocouple tip is fastened to the end of a 36″ long lance making the total length of the pyrometer approximately 48″. The easily replaceable tip can be ordered or replaced with 12″ or 15″ thermocouples. The instrument also has open thermocouple indication to let you know if the thermocouple tip needs replacing. 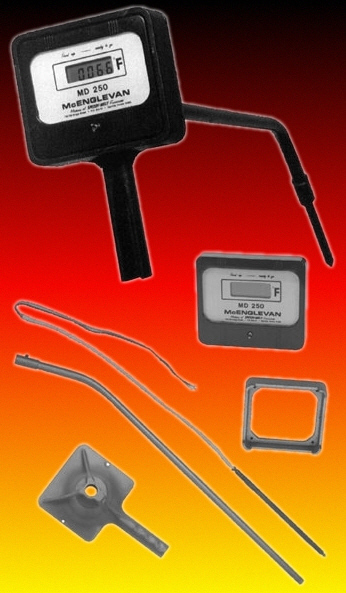 All components of this pyrometer are replaceable with simple tools in minutes. For consistent quality castings you should have a user friendly MD-250 digital pyrometer in your foundry.